If you want to see remarkable things happen in a community, pay attention to where talented young women are investing their time and energy to make a difference. A transformation and rebirth of the Leavenworth Community Farmers Market is underway because a group of local women came together and decided that the market was a critical community asset that could bridge the sometimes uneasy divide that has existed between the business community and local residents. They are focused on strengthening the entire community. I met with new market manager Hana Butler and board vice president Tara Walter-Waugh to learn more about market’s plans to foster and encourage a stronger Leavenworth. A few years ago, Butler told me, a group of friends gathered to discuss the importance of the market and decided to get involved. Leavenworth, thanks to its phenomenal success in bringing in tourists, can be a tough place for locals, especially those of limited means. Home prices and rents have skyrocketed to the point that housing affordability is a serious issue. Maintaining a thriving local community in those circumstances is difficult. Butler talked to me about the tension that exists. There has been some sentiment in the business community that the farmers market is a granola, back to nature group of idealists. And community members get frustrated with the traffic, misbehaving tourists and the other impacts of the extraordinarily successful business approach of the Bavarian Village. Butler, Walter-Waugh and the rest of the leaders involved in the market, are committed to the commercial success of Leavenworth as well as the success of residents who live there year round. That’s important because they don’t see community and commercial success as mutually exclusive. Rather than one or the other, they want both to thrive and succeed. Who could argue with that logic? What these young leaders see is an opportunity for the farmers market to be a hub for community members of all ages that could also create another quality experience for visitors. They are working to make the market a hub of music, access to fresh food that is available to people of all income levels, as well as a meeting place for community members with a special emphasis on kids’ activities. 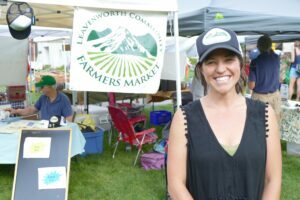 The market can bring a fresh dynamic to the appeal of Leavenworth by teaching locals and visitors how to live more sustainably, Butler told me. Furthermore, she envisions the possibility of creating opportunities for visitors who have seen the sights of the valley to have an experience having a hands-on experience at a local farm. It could be a place for kids to learn about where food comes from and participating in some way. The transformation of the market started last year under market manager Jenny Bourgeois, who remains on the board. The pace is quickening. Walter-Waugh, who runs a small catering business and works several other jobs, is a fearless and engaging soul who has been seeking out sponsorships from local businesses. The restaurants in the community are already supporters of the market, and Walter-Waugh said she has been blown away by the support they are receiving. Local businesses see the value of this community asset and are stepping forward to help with sponsorships. Tumwater Drilling has stepped forward to be the title sponsor for the season, The Loft is partially sponsoring music at the market, and South has signed on to fully support the Kids Makers Market for the season. They are looking for sponsors for several other sponsors to help them bring the community together in a healthy way. The market, Butler said, is also doing more to provide access for low-income folks to afford fresh local produce through the SNAP (Supplemental Nutritional Assistance Program). This is in line with their commitment to serving the whole community. Butler said everyone on the board is charging forward with great commitment and enthusiasm, which is making her job much easier. Besides Walter-Waugh, board members include Eron Drew, Jessica Kendall, Bourgeois, Jamie Poe, Nadine Witkowski, Laura Lentz and Ellie Chikkaraju. The Leavenworth Community Farmers Market board sees a vision of building a stronger community through their service. It’s a vision that deserves support. The market also supports the Veggie Voucher Program through Upper ValleY Mend and the Farmers Market Nutrition Program for Women, Infants and Children. If you want to become a member of the market and support their work or become a sponsor, contact Butler at leavenworthmarket@gmail.com. 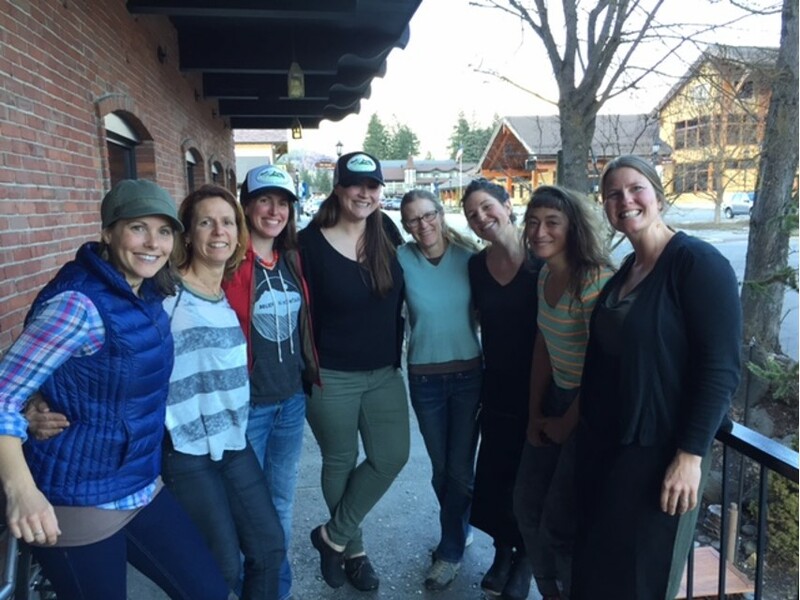 Left to Right: Hana Butler (market manager), Nadine Witowski, Jessica Kendall, Tara Walter-Waugh Eron Drew, Jenny Bourgeois and Ellie Chikkaraju. and Not pictured is Jamie Poe.